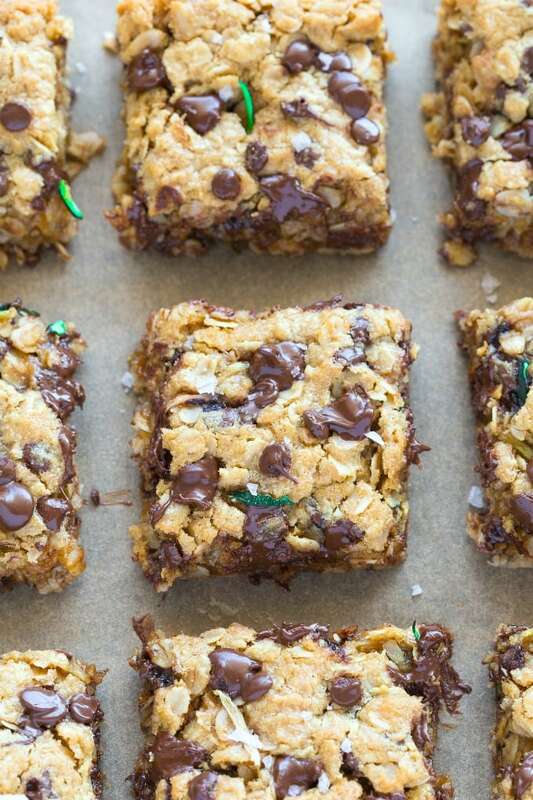 These vegan and gluten-free zucchini bars with chocolate chips are quick, easy and delicious! Made with oatmeal, banana and loaded with shredded zucchini, these zucchini bars have a soft and gooey texture. Check out the keto, paleo, and low carb option. A delicious dessert made with zucchini that is healthy enough for breakfast? These zucchini bars tick all the boxes! It’s no secret that I love healthy desserts made with zucchini. We’ve had zucchini chocolate chip cookies, zucchini brownies, and even a chocolate zucchini cake. 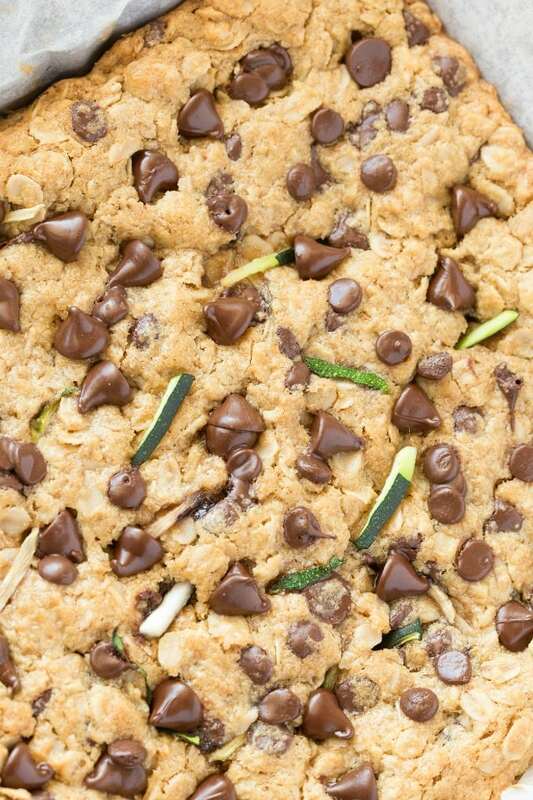 It’s time now for some delicious zucchini chocolate chip bars! I tested this recipe out several times, hoping to come up with one version which is not only vegan and gluten-free but also paleo and keto friendly. Unfortunately, the winning combination I came up with was just a little too high in carbs. Instead, I opted to share two tested recipes for zucchini bars- To fit as many diets out there! The vegan and gluten-free option is made with oatmeal and sweetened with a banana to provide a naturally sweet and gooey bar. The low carb and keto version is made with almond flour and almond butter and is sweetened with monk fruit, a zero calorie sweetener. Start by shredding your zucchini and removing the excess liquid from it. Line an 8 x 8-inch pan with parchment paper and set aside. In a seperate smaller bowl, add your wet ingredients and whisk until combined. Combine the wet and the dry ingredients, except for your chocolate chips, and mix until fully incorporated. 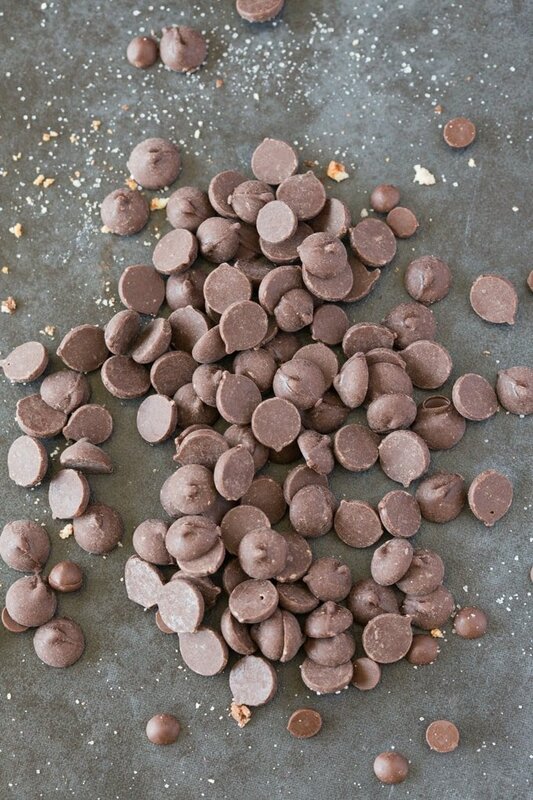 Fold in your chocolate chips. Pour the zucchini bar batter into the lined pan. Using a spatula, spread out in an even layer. Top with some extra chocolate chips. How long to bake the zucchini bars depends on what oven you use and which option you choose to make. These bars need to be baked for 18-25 minutes, or until a toothpick comes out clean. If you remove them when they are ‘just’ baked, they will be ultra gooey and soft. Allow the bars to cool completely in the pan, before slicing into bars. Should you refrigerate zucchini bars? 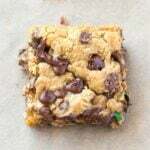 Zucchini chocolate chip bars should be stored in the refrigerator, as the texture will spoil when left at room temperature. Ensure the bars are kept in a sealed container, or on a plate wrapped in saran wrap. Zucchini bars are also freezer friendly and can be stored in the freezer to enjoy later. They will keep for 2 months. Wrap zucchini bars in parchment paper, and if possible, freeze in single bar portions. To enjoy zucchini bars from the freezer, thaw overnight in the fridge, or at room temperature. You can re-heat them in the microwave for 30-45 seconds, or until the chocolate chips have melted. While rolled oats are preferred, you can substitute this for quick cooking oats. The texture will be a little softer, but you can combat this with an extra tablespoon of oats, or even gluten-free oat flour. You can also substitute the oats completely for quinoa flakes or buckwheat flakes, but the texture will be different and be a little less sturdy. The banana provides sweetness and helps keep the bars soft and chewy. You can substitute this for applesauce or pumpkin. You will need 2 1/2 cups. Also, be sure to add some liquid stevia or maple syrup, as the bars will no longer be overly sweet. Keep these flourless bars nut-free, by substituting the peanut butter for one of the following- Sunflower seed butter, tahini, or wow butter. Use a combination of dairy free mini chocolate chips and chocolate chunks, to ensure they are evenly dispersed. 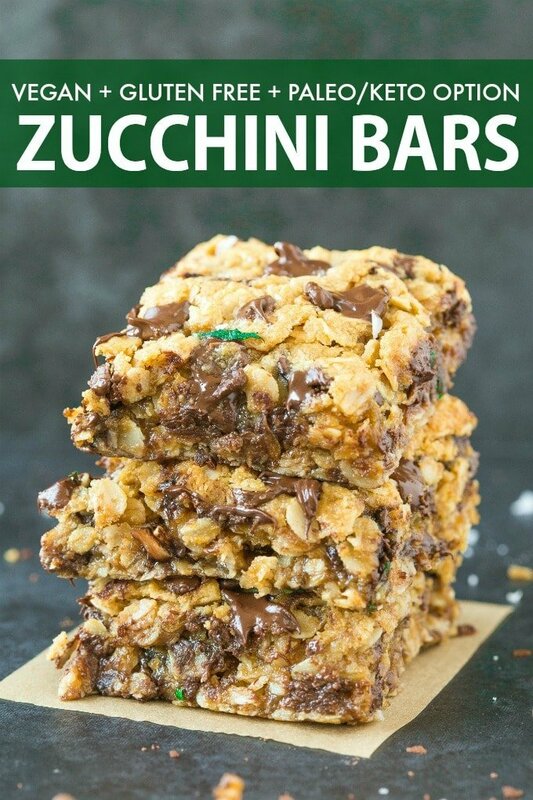 Make sure all the moisture is squeezed out of the zucchini, otherwise, your bars will be moist and undercooked in the center. Ensure you use blanched almond flour, to provide a lighter flavor and texture. You can use fine almond flour, but it will be darker and have a nuttier flavor. Avoid using almond meal, as this will make the bars extremely gritty. Swap out the almond butter for another nut butter, like peanut butter or cashew butter. I prefer using stevia sweetened chocolate chips, but you can also use other sugar free chocolate chips. Alternatively, you can add some roughly chopped unsweetened chocolate. Be wary though, this will be rich and dark tasting. Healthy zucchini bars made with chocolate chips, shredded zucchini and naturally sweetened! Made with oatmeal and banana, it's moist, gooey and tender on the outside! Naturally vegan and gluten-free, it comes with a TESTED keto, low carb and paleo option! In a large mixing bowl, add your dry ingredients and mix well. In a seperate bowl, add your wet ingredients, except for your zucchini and chocolate chips, and mix well. Combine your dry and wet ingredients and mix well, until fully incorporated. Fold in your chocolate chips and shredded zucchini. Transfer the zucchini bar batter into the lined pan and spread out using a rubber spatula. Top with extra chocolate chips and bake for 18-25 minutes, or until a toothpick comes out clean. Allow the zucchini bars to cool in the pan completely, before slicing up into 8 bars. Zucchini bars should be stored in the fridge and will keep for at least 2 weeks. The bars are freezer friendly and can be kept frozen for up to 2 months. Nutritional Information is based on the vegan + gluten-free option. Nutritional Information for the keto/low carb option is as follows- Per 1 Bar (recipe makes 8)- Calories- 249. Fat- 24 grams. Protein- 6 grams. Carbs- 6 grams. Fiber- 4 grams. Net Carbs- 2 grams. This is not keto friendly. How about sugar free recipes for diabetics? Have several friends who are diabetics so when I have to take stuff to meetings I can take something they can eat. You would be best to run it by a medical professional. YES something healthy, delicious, and sweet that includes almond flour! Zucchini is a freaking bomb ingredient and I miss baking with it. These bars are a wonderful way to start!